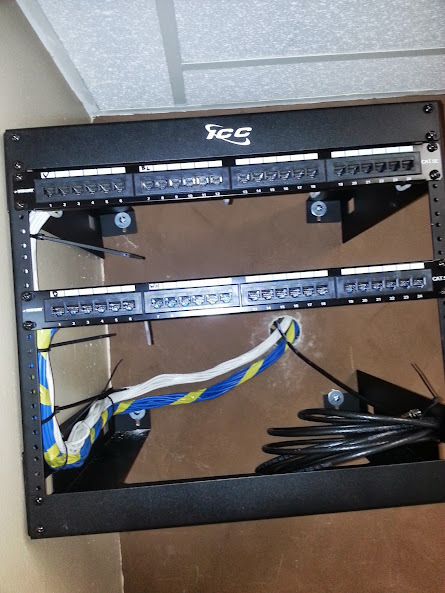 nyphonejacks: double network 12 runs each with patch panel and rack. 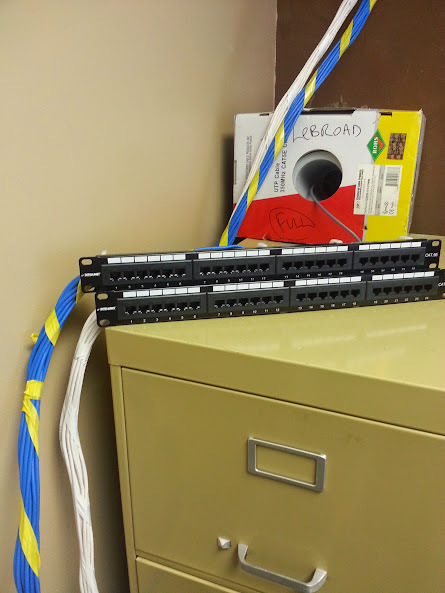 double network 12 runs each with patch panel and rack. Closeup of the finished rack. The camera was crooked not the rack! Each location has a total of 2 jacks each. 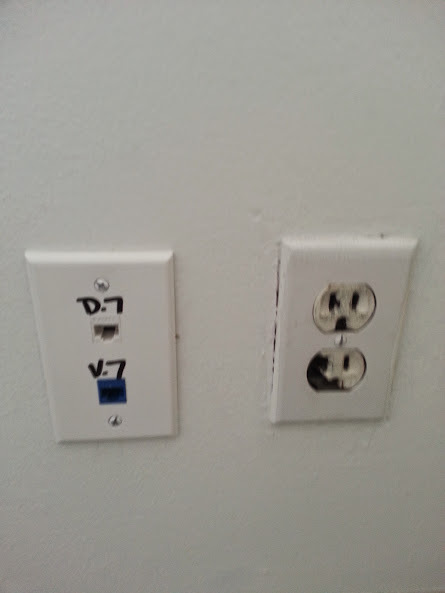 One for the VoIP network, and one for the PC data network. 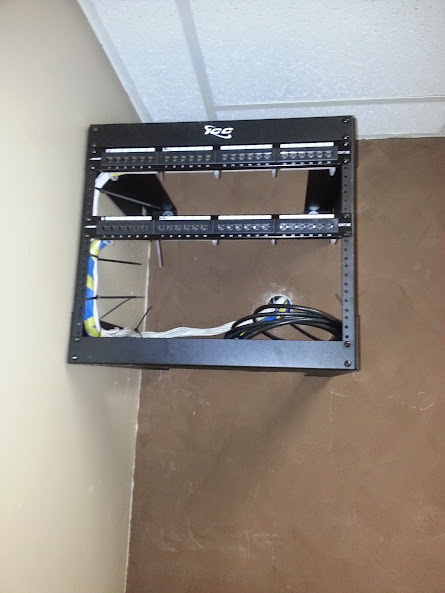 An 8U rack was installed, and 2-24 port patch panels were installed. 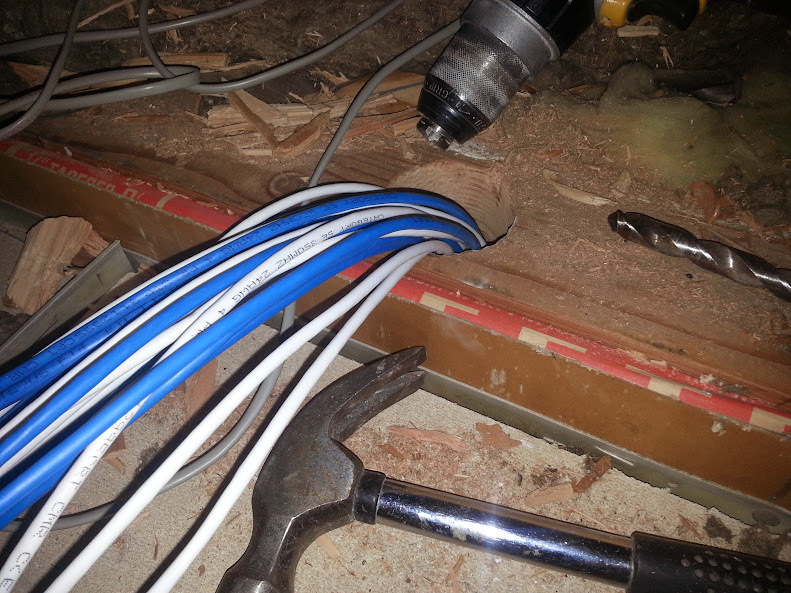 I also ran an RG6 from the cable tap in the hallway to the rack so that the cable modem could easily be installed when ready. This job was given to me, like all other jobs - with incomplete, or inaccurate information. I was told that this was a job for "5 double runs" or a total of about "15 runs". Either someone does not know math (5x2=10, not 15) or they were just guestimating what the customer needed based solely on information provided by the customer over the phone or email, and not surveying the job, or the requirements of the customer. 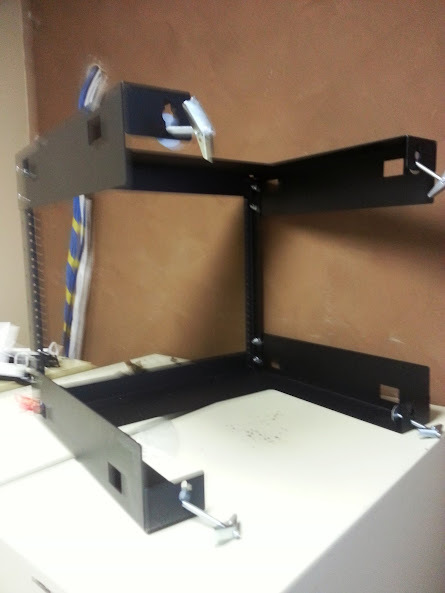 Rack mounted, patch panels all punched down ready to be installed. 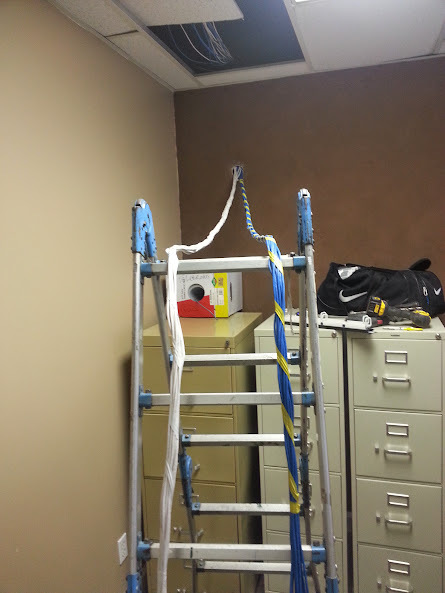 The first day I arrived on site to survey and begin work I was severely lacking enough materials to complete the job, but I was able to get "5 double runs" from where my rack was going to be mounted, and down the walls at the desk locations. ready to be mounted to the wall. After finding out what time my supplier closed, and phoning in an order it was time to depart. I had exhausted the materials that I had brought with me, and it was a long trip back to the supplier before they closed. Both patch panels punched in. After 2 local service calls in the morning, it was back to finish up the wiring. I had all the materials and was ready to go. 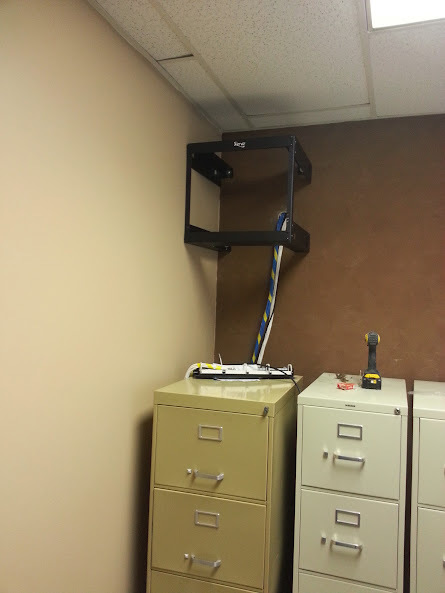 All wires were finally able to get pulled from the location where I decided to place the rack and snaked down the walls. 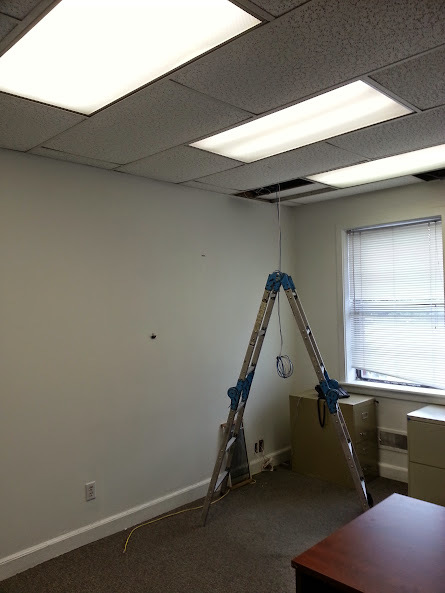 Unfortunately due to the service calls in the morning, this meant that I only had half-day, but was at least able to pull all the cables down the walls. Wires brought down wall behind where rack will be installed. VoIP and PC network wiring separated. Day 3 I was able to get the all of the wires punched down, all of the face plates installed, and all the jacks labeled and tested. Unfortunately after labeling the first jack my label machine started smoking and no longer would function, so all other jacks had to be hand labeled with a marker. 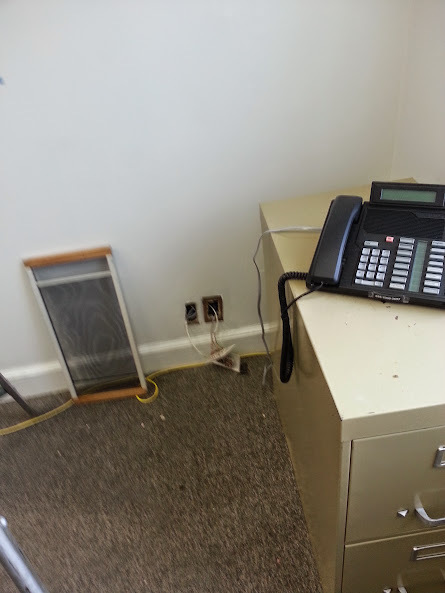 I also was able to get the wires run down the wall behind my rack location, install the RG6 wire for the cable modem, and run a CAT5 loop for additional door phones, which unfortunately the model that the customer currently has is discontinued, so no hardware could be installed. Wires snaked inside wall behind rack's location. With EVERYTHING completed it was time to mount the rack. But, guess what? The box that I had brought from inventory that was in the box that an 8u rack comes in was not a rack! Someone had reused the box, and taped it up, so when I opened the tape to get to my rack, it was an old piece of networking equipment and not a rack. 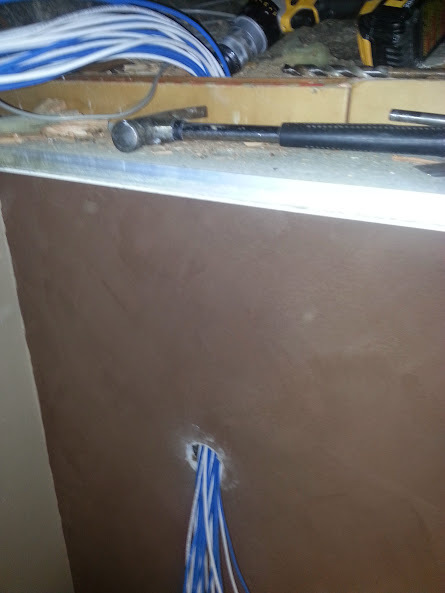 Yes that wood beam is as deep as it looks, it has to be at least 4 or 5 inches thick! With nothing left to do, I called the supply house once again, and put in an order for a rack, since I knew I would be arriving there just as they were closing. I was able to get the rack, and jump start my day with an hour long drive for the 15 minute task of mounting the rack to the wall! Old phone from old tenant. and many of the old wires were used to snake my wire down the walls. Finally, after 2 half days, 1 full day, and 15 minutes the job was finally completed! 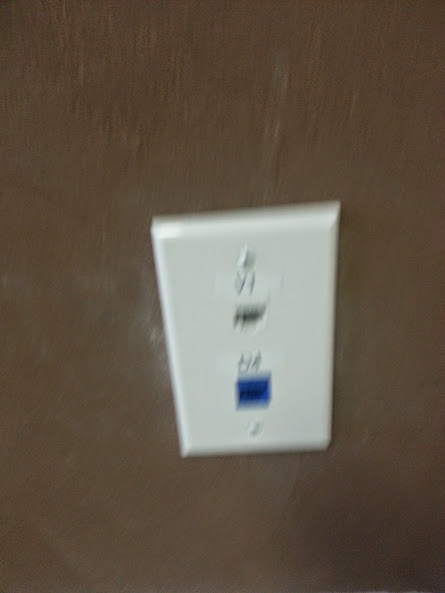 Now lets just hope whoever patches in the network equipment does a neat job with the patch cords, and mounting the router and switches. waiting to be snaked down the wall. Sorry for the blury image. before my label machine started smoking. All additional jacks were hand labeled with a marker. 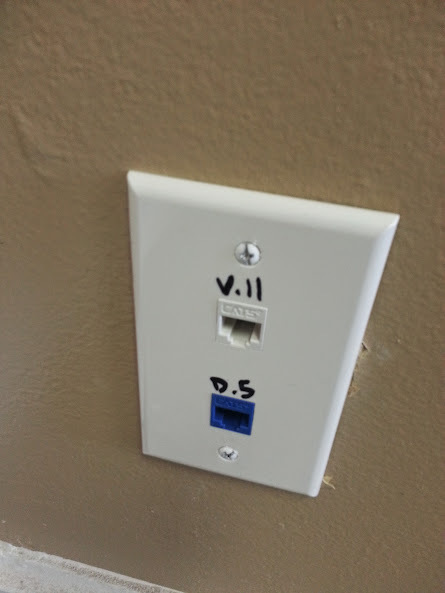 on this jack only the voice is blue and data is white. Both pass, so no need to stress out redoing the jacks.